If you work in the construction industry then you will know that sometimes a special type of shackle is needed. This is especially so during the ground preparation work. Our range of long dee shackles (piling shackles) are ideal for use throughout many types of ground prep tasks. steel piling sheets for shoring up the ground. They need to be longer than a standard dee shackle to enable them to be located through the hole lower down the piling sheets. These high tensile steel shackles have an MBL = 5 x working load limit safety factor. 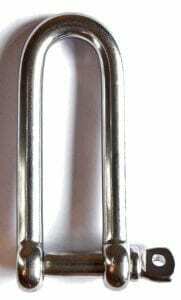 The pin is a type ‘A’ screw collar pin. The alloy dee piling shackle is self coloured and comes in a range of sizes to meet many situations. With 1 tonne up to 5 tonne WLL’s and a few incremental sizes in between we should have a long dee shackle to suit your weight needs. 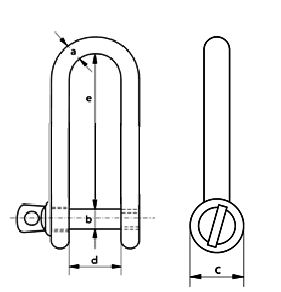 The maximum inside length is 305mm for the largest shackle, see the chart for more details. 01384 78004 is the number to dial if you need to talk to us, whether it’s for advice or to place an order and make a payment. Our friendly team are always ready to help. Long Dee Shackles Overall rating: 5 out of 5 based on 6 reviews.